On the 2nd (Sat), explore the striking landscape of Zion National Park. Keep things going the next day: trek along The Narrows. For more things to do, where to stay, photos, and tourist information, read Zion National Park route planning website . Salt Lake City to Zion National Park is an approximately 4-hour combination of flight and car. You can also do a combination of flight and taxi; or drive. When traveling from Salt Lake City in March, plan for a bit warmer days in Zion National Park, with highs around 20°C, while nights are a bit cooler with lows around -1°C. Cap off your sightseeing on the 3rd (Sun) early enough to go by car to Bryce Canyon National Park. Kick off your visit on the 4th (Mon): take in breathtaking views at Sunset Point, get great views at Paria View, then take some stellar pictures from Inspiration Point, and finally hike along Navajo/Queens Garden Loop. For ratings, other places to visit, traveler tips, and more tourist information, go to the Bryce Canyon National Park trip planner . You can drive from Zion National Park to Bryce Canyon National Park in 3 hours. Traveling from Zion National Park in March, expect Bryce Canyon National Park to be a bit cooler, temps between 11°C and -7°C. Finish up your sightseeing early on the 4th (Mon) so you can go by car to Monument Valley. Monument Valley is a region of the Colorado Plateau characterized by a cluster of vast sandstone buttes, the largest reaching 1000ft above the valley floor. On the 5th (Tue), tour the pleasant surroundings at Wildcat Trail, then examine the collection at Goulding’s Trading Post Museum., and then admire all the interesting features of Monument Valley Navajo Tribal Park. To see where to stay, more things to do, traveler tips, and more tourist information, refer to the Monument Valley road trip planning app . You can drive from Bryce Canyon National Park to Monument Valley in 6 hours. Expect a bit warmer temperatures when traveling from Bryce Canyon National Park in March; daily highs in Monument Valley reach 16°C and lows reach 0°C. Finish your sightseeing early on the 5th (Tue) so you can drive to Moab. On the 6th (Wed), take your sightseeing to a higher altitude at Arches National Park. Get ready for a full day of sightseeing on the 7th (Thu): explore the striking landscape at Island in the Sky, then immerse yourself in nature at Dead Horse Point State Park, and then view the masterpieces at Tom Till Gallery. For other places to visit, where to stay, and other tourist information, refer to the Moab trip itinerary builder . Drive from Monument Valley to Moab in 3 hours. 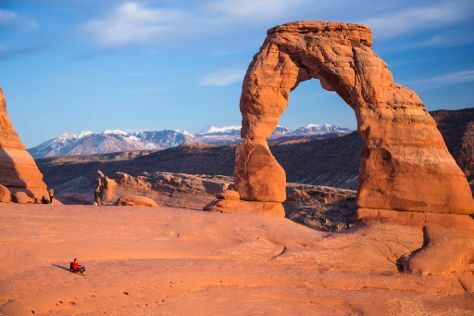 In March in Moab, expect temperatures between 19°C during the day and 0°C at night. Finish your sightseeing early on the 7th (Thu) so you can travel to Salt Lake City. Kick off your visit on the 8th (Fri): fly down the slopes at Deer Valley Resort, contemplate in the serene atmosphere at Salt Lake Temple, and then contemplate in the serene atmosphere at Temple Square. Get ready for a full day of sightseeing on the next day: learn more about the world around you at Natural History Museum of Utah, take a stroll through Park City Main Street Historic District, and then soothe aching muscles at some of the top local wellness centers. To see more things to do, where to stay, reviews, and other tourist information, refer to the Salt Lake City vacation planner . You can do a combination of car and flight from Moab to Salt Lake City in 3.5 hours. Alternatively, you can drive; or do a combination of car and train. Plan for somewhat warmer nights when traveling from Moab in March since evenings lows in Salt Lake City dip to 3°C. Finish your sightseeing early on the 9th (Sat) to allow enough time to travel back home.